In a comprehensive safety study conducted by Florida Department of Transportation traffic operations, the state is looking into creating two-way turn lanes in the area of Rock Creek as part of a project that stretches down Northwest 34th Street from Northwest 16th Avenue to U.S. Highway 441. The project could start as early as 2021, relieving the area of traffic crashes caused from drivers making left-hand turns. When Erin King moved to the Rock Creek neighborhood in 1993, a neighbor told her that widening Northwest 34th Street in front of the subdivision’s entrance and putting in a turning lane was part of a five-year plan. But 25 years later, the two-lane road remains the same with the exception of pronounced tire marks on Northwest 34th Street’s grassy shoulder. “The grass on the side of the street has been completely driven over because drivers go around and pass on the sidewalk when there is somebody stopped to turn left into the neighborhood,” King said. Not only are cars passing stopped cars that are turning left into Rock Creek, located on Northwest 30th Place, but they’re also rear-ending them. There were 34 reported crashes on the one-mile stretch of Northwest 34th Street between Northwest 16th Avenue and Northwest 31st Avenue — which contains Rock Creek — in 2017, according to traffic crash data provided by Gainesville Police Department. There were five in January. And those are only the crashes that were reported to law enforcement. A request was made by Gainesville’s Metropolitan Planning Organization to look at a number of intersections on Northwest 34th Street, to see where the state can add turning lanes, Troy Roberts, Florida Department of Transportation spokesman said. According to Roberts, crash data is used in examining what crashes could have been prevented with turn lanes. Roberts said the safety project from NW 16th Avenue to U.S. Highway 441 is scheduled to start design in 2021 at the earliest. “That is probably the most frequent type of crash, when there is somebody right there waiting to turn left into the neighborhood and they get rear-ended,” King said. According to the Florida Department of Highway Safety and Motor Vehicles handbook, vehicles traveling in either direction must not cross a double solid-yellow line unless it is safe to turn left. The concerns of the frequent crashes in the area are not the only thing on King’s mind. A number of years ago, King recalls that the school district changed the bus stop to let students off directly in front of the neighborhood, but on the opposite side of the street. 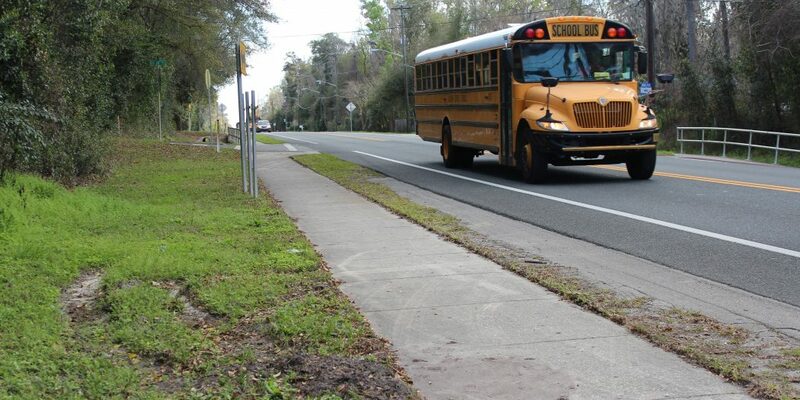 “The elementary, middle and some high school buses stop here, and the kids have to get out and cross in front of the bus to cross the street,” King said. When King’s daughter was in elementary school, she would meet the bus on the side of the road every afternoon. King recalls a particular time when a school bus stopped, and a car behind the bus went around on the grass to pass the bus. 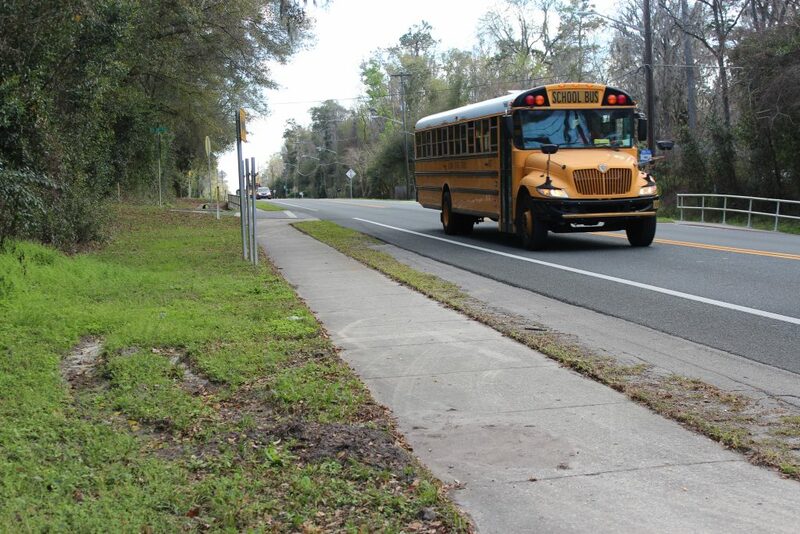 “As far as motorists passing stopped school buses, residents can ask for increased patrols by Gainesville police and let them know of the situation as it is a traffic violation,” Chip Skinner, City of Gainesville spokesperson, said. Franziska Raeber, a resident of the neighborhood since 2010, said previously at board meetings, they have reached out to police concerning the safety of the entrance to the neighborhood. Law enforcement has attended the meetings in the past. Raeber has three children who go to Littlewood Elementary School. With reported crashes increasing by a few crashes every year, according to traffic crash data, King believes information revolving around their frequency would be useful to the city’s traffic engineers, school board and RTS bus routes. “In a section of the city where new developments are going into place, this is information that developers would want to have to be able to work with the city traffic plan.” King said. The information, King suggests, could also be useful to someone considering buying a home.